The sight of a herd of impala gracefully leaping across the road in full flight from hungry cheetahs is astounding enough, which is what prompted spectators to begin videorecording the spectacle. 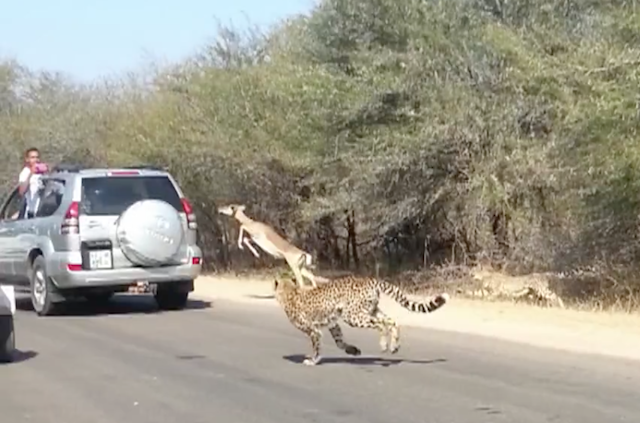 No one, including the impalas or the cheetah, would have expected that one of them would solve the problem of being hunted by the fierce predator by leaping inside one of the vehicles to safety. The incident took place in South Africa’s Kruger Park and both the antelope and the park’s visitors were unharmed. The only thing that could have made it any more epic is if the vehicle had been a Chevy Impala. that can NOT be real. It can not. But, it is, isn’t it.